It's time for our Wednesday challenge over at The House That Stamps Built. This week we have an inspiration board for you. This challenge is a fun cross between a photo challenge and a color challenge. You can choose to be inspired by the colors, the photograph, or both! 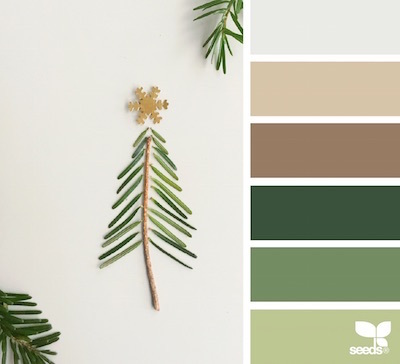 I chose to be inspired by both the pine branches of the Christmas tree and the earth tone color pallete along with the little gold snowflake on top the tree. I decorated the inside with a piece of washi tape and a few more holiday greens. TIP: Since I didn't have any gold paper on hand, I die cut my berries from white cardstock, inked it with versamark, added gold embossing powder and wa-la a shimmery accent to match the bulb on the outside! Such a beautiful card and great take on the photo! Have a Merry Christmas! Lots of beautiful detail on this gorgeous card, Esther. The ornament in gold is stunning and I love the way it's draped from the pine branches. Your inside touches are fabulous. Gold embossing those berries was a great idea. Merry Christmas! Wonderful take on the inspiration photo! I like the distressing around the edges, it really makes this stand out. Merry Christmas to you and yours. Oh how pretty - love how you always decorate the inside of the card as well. Love your snow "splatters". Merry Christmas. That is just gorgeous, love the colors and the great splattering for the snow!! This is such a beautiful card inside and out! I really like the earthy look and feel of this calming card! Great design and distressing too! Loving the pines and splattered snow! Gorgeous! This is so rustic feeling and beautiful! The ornament looks perfect "hanging" off the pine boughs.